Why does optimising for robustness leave organisations in a state of Discontinuous Delivery, and vulnerable to failure? How does optimising for resilience improve reliability, and how can it encourage the adoption of Continuous Delivery? In this article Steve Smith explains why the traditional IT approach of prioritising MTBF results in Discontinuous Delivery, and how prioritising MTTR instead can power Continuous Delivery adoption. As software continues to eat the world, organisations must have reliable IT services at the heart of their business if they are to innovate in rapidly changing markets. Reliability is defined by Patrick O’Connor and Andre Kleyner in Practical Reliability Engineering as “the probability that [a system] will perform a required function without failure under stated conditions for a stated period of time“, or as a function of Mean Time Between Failures (MTBF) and Mean Time To Repair (MTTR). These practices are inherently slow, and a form of Risk Management Theatre 1. End-To-End Testing incurs long execution times and significant maintenance time, and defects can still occur. Change Advisory Boards involve slow approval times, and deployments can still fail. Change Freezes cause huge productivity impediments, and failures can still happen. In addition, the long deployment lead times caused by robustness practices ensure a large batch of requirements and technology changes per release, which actually increases the risk of failure 2. Optimising For Robustness constrains the stability and throughput of IT delivery such that business demand cannot be satisfied. It is the predominant reason why so many organisations are trapped in a state of Discontinuous Delivery. Ironically, Optimising For Robustness leaves an organisation ill-equipped to deal with failure. In Resilience and Precarious Success, Mary Patterson and Robert Wears describe how “fundamental goals (such as safety) tend to be sacrificed with increasing pressure to achieve acute goals (faster, better, and cheaper)“. When an organisation optimises for robustness it will under-invest in its production environment, resulting in unimplemented “non-functional” requirements, inadequate telemetry 3, snowflake infrastructure, and a fragile service architecture. This will be considered acceptable, as failures are expected to be rare. However, it is naive to think of a production environment of running services as a complicated system. A production environment is an intractable mass of heterogeneous processes, with unpredictable interactions occurring in unrepeatable conditions. It is a complex system of emergent behaviours, in which the cause and effect of an event can only be perceived in retrospect. Furthermore, as Richard Cook explains in How Complex Systems Fail “the complexity of these systems makes it impossible for them to run without multiple flaws“. A production environment is perpetually in a state of near-failure. A failure occurs when multiple faults unexpectedly coalesce such that one or more business operations cannot succeed. It will create a revenue cost expressed as a function of cost per unit time and duration, and in an organisation optimised for robustness the impact can be considerable. The sunk cost incurred until failure detection can be high, as unimplemented “non-functional” requirements and inadequate telemetry will restrict situational awareness. The opportunity cost until failure resolution can also be high, as snowflake infrastructure and a fragile architecture will increase failure blast radius. In addition, the loss of customer confidence and increased failure demand will create further opportunity costs. Consider a Fruits-U-Like website optimised for robustness. Its third party registration service begins to suffer under load, and new customers are rejected on checkout. The failure has a static cost per day of £80k, but with no telemetry the failure is not detected for 3 days. The checkout team then produces a hotfix within a day, and it is deployed the following day. The revenue cost is £400K, with a £240K sunk cost and a £160K opportunity cost. Optimising For Robustness encourages an attitude Sidney Dekker calls the Bad Apple Theory, in which a system is considered absolutely reliable except for the actions of unreliable employees. When a failure occurs, the combination of the Bad Apple Theory and hindsight bias will produce an oppressive culture of naming, blaming, and shaming the individuals involved. This discourages knowledge sharing and collaboration. An interesting consequence of Optimising For Robustness is Dual Value Streams. An organisation optimised for robustness will have feature value streams with deployment lead times of weeks or months. When a failure is detected its sunk cost will create urgency, and people will want to immediately minimise the opportunity cost duration. That will lead to robustness practices being sacrificed for speed, in a truncated fix value stream with an MTTR of hours or days 4. The robustness practices omitted from the fix value stream should be considered theatre until proven otherwise. Continuous Delivery improves the stability and throughput of IT delivery, but it is hard. A Continuous Delivery programme in an organisation optimised for robustness will not succeed if it is focussed solely on throughput. The most significant accelerator of deployment lead time will likely be the removal of robustness risk management theatre, but practices like End-To-End Testing will be woven into the fabric of the organisation 5. If they are forcibly removed, Continuous Delivery will be blamed for the first subsequent production failure. Resisters will lobby for more robustness practices, and a return to the status quo is all but inevitable. Unfortunately, it only takes one inopportune failure for a Continuous Delivery programme to be cancelled. A far more effective reliability strategy is Optimising For Resilience. This means prioritising a lower MTTR over a higher MTBF for IT services, by rapidly responding to failures in a production environment. Some classes of failure should never occur, some failures are more costly than others, and some safety-critical systems should never fail, but in general organisations should adhere to John Allspaw’s advice that “being able to recover quickly from failure is more important than having failures less often“. If Fruits-U-Like was optimised for resilience its checkout team could receive an alert within 5 minutes of third party registration errors. A Circuit Breaker would allow some registrations to succeed, and a Bulkhead could trigger an anonymous checkout for failed registrations. This could decrease the cost per day to £5K, and a hotfix could be deployed within 3 hours. The revenue cost would be £625, with a £18 sunk cost and a £607 opportunity cost. This bootstrap sequence can guide the formative steps of a Continuous Delivery programme, and build confidence throughout an organisation. It demonstrates a commitment to stability, transparency, and reliability which will help to win over resisters. Storing all code, configuration, infrastructure definitions, documents, scripts etc. in version control eliminates the predominant source of failure demand. Creating stability and throughput indicators helps people to understand their delivery capabilities, and make better decisions 7. Improving production reliability minimises the cost of failure, and lays the groundwork for challenging robustness risk management theatre later on. Automated anomaly detection and alerting will speed up the detection time of an anticipated failure, reducing its sunk cost duration to seconds or minutes. An adaptive architecture will limit the blast radius of a failure, decreasing both cost per unit time and duration. Implementing production telemetry early on also provides insurance for unsafe-to-fail situations. 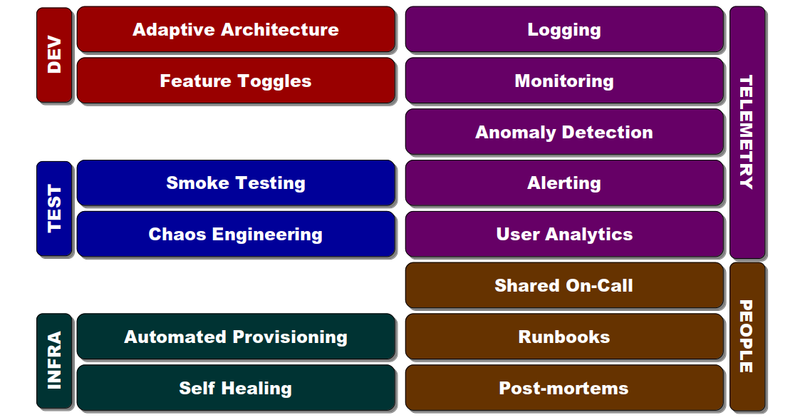 Logging, monitoring, and analytics dashboards can identify the contributing technical faults to a failure, and when they first entered production. If resisters blame Continuous Delivery for a failure, the data will pinpoint which faults were recent and which were lying dormant in production beforehand. Once the Continuous Delivery programme reaches the experimentation phase, other sources of adaptive capacity can be created with operability practices such as Capacity Planning, Self-Healing, Shared On-Call, and Blameless Post-Mortems. At the same time, the programme should widen its focus to include deployment throughput as well as deployment stability and production resilience. The key to removing robustness risk management theatre is to visualise its costs to stakeholders and offer a practical alternative, rather than rely on theoretical arguments about wait times or defect discovery rates. Using the Resilience As A Continuous Delivery Enabler heuristic ensures a Continuous Delivery programme can supply those visualisations, and outline an alternative approach from the outset. Stakeholders should be made aware of their robustness risk management theatre with a showcase of the delivery awareness and production reliability improvements so far. The stability and throughput indicators will illustrate the historical cost of robustness practices, by visualising the disparity between deployment lead times and MTTR in the Dual Value Streams. Some carefully calibrated Chaos Engineering in a test environment 8 will demonstrate how MTTR has been shrunk to minutes or hours, by showing how failures can be managed with the new production telemetry and adaptive architecture. An MTTR an order of magnitude faster than deployment lead times will show stakeholders what a team can accomplish with minimal robustness practices. Change Advisory Boards and Change Freezes should end in favour of incremental deployments and incremental launches. Blue Green Deployments and Canary Deployments gradually direct users to a newly deployed service version, and users can be redirected to the old version on service failure. Dark Launching controls feature rollouts based on user demographics, and services can be operated in a degraded state on feature failure. Lightweight change management conversations should be reserved for unavoidably large releases, or turbulent market conditions. Optimising For Robustness is an antiquated, flawed approach to IT reliability that results in long-term Discontinuous Delivery and an operational brittleness that begets failure. As John Allspaw has stated, reliability is “the presence of adaptive capacity, not the absence of failures“. Robustness is of value, but it must be rejected as an outcome if an organisation wants to innovate in changing markets. Optimising For Resilience is a superior reliability strategy that enables an organisation to gracefully extend to limit the impact of failures, and position itself for sustained adaptability. It is a paradigm shift, in which people need to accept the inherent complexity within their IT services and the hard truth that failures are inevitable. This is neatly summarised by David Woods’ assertion that “graceful extensibility trades off with robust optimality“. An organisation optimised for robustness will reject sources of adaptive capacity such as Circuit Breakers as inefficiencies, but to an organisation optimised for resilience its graceful extensibility is more important than cost efficiencies. If an organisation has optimised for robustness a Continuous Delivery programme focussed on throughput alone is unlikely to succeed. Resilience As A Continuous Delivery Enabler is a heuristic that advocates resilience as the focus of Continuous Delivery, and using it to bootstrap a Continuous Delivery programme improves production reliability from the outset. Improving the resilience of services by an order of magnitude makes it easier to offer a series of practical alternatives to robustness risk management theatre, and reduce deployment throughput until there is a single value stream that can satisfy business demand 9.